With Houston-based manufacturing company ValvTechnologies’ Quick-Ship program customers can get the original, industry leading zero-leakage metal seated ball valve shipped to them in as little as 24 hours. ValvTechnologies announced today the launch of a Quick-Ship program in partnership with Portersville PRD and Celtex Industries. Need a valve today? 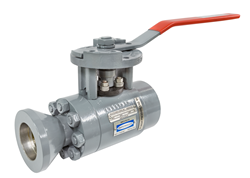 With ValvTechnologies’ Quick-Ship program customers can get the original, industry-leading zero-leakage metal seated ball valve shipped to them in as little as 24 hours. ValvTechnologies is proud to announce a North American satellite operations agreement with Portersville PRD and Celtex Industries to provide quick-shipped stock V1-1 valves when customer delivery requirements fall outside ValvTechnologies’ standard delivery times. The Quick-Ship program provides the distribution network with the opportunity to order and take delivery of the best severe service metal seated isolation valves in the industry in as little as 24 hours, guaranteeing our customers can get their critical valves when they need them. ValvTechnologies' superior V Series zero-leakage metal seated ball valves are stocked and ready to ship within 24-48 hours. ValvTechnologies' valves are assembled, inspected and tested before shipment to ensure zero-leakage, which means customers receive the most reliable solution the market has to offer. ValvTechnologies’ satellite operations Portersville PRD and Celtex Industries stock and quick-ship V Series valves to ValvTechnologies’ North American distribution network with 24-48 hours. The finest metal seated valves in the world are engineered and manufactured right here in the Unites States. We’re proud of our product quality, and even more proud that we craft all our products in Houston, Texas. Learn more – visit us online today.